Inside the Secret Garden Room, Which is Really Just a Walkout Basement I Designed with a Wall of French Doors, Leading to the Walled Courtyard Beyond. For More Images of This Room, Click Here. 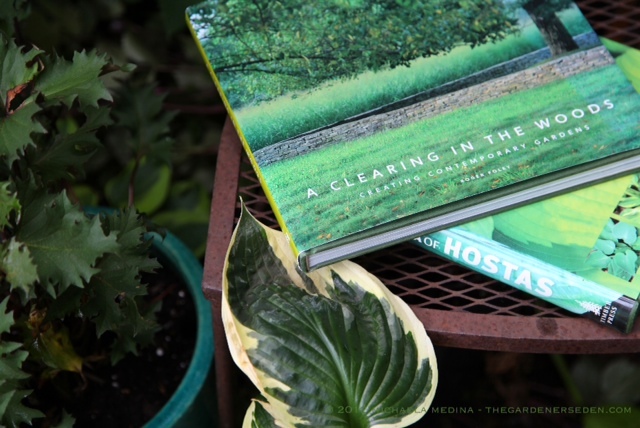 When I’m working on a garden design for a client, or even when I’m just relaxing on a day off, more often than not, I am surrounded by a stack of books. My over-flowing shelves and teetering stacks include a great number of shade garden reference books. Secret gardens and shade gardens are two of my specialties as a garden designer. In fact, it seems I’m almost always working with shade — currently designing three shade gardens— so I’m constantly researching the latest and greatest new plant introductions for low light conditions. Familiarizing yourself with zone and site appropriate plants is not unlike learning about possible ingredients before you begin creating a new recipe. I make endless lists of plants when I visit local nurseries and garden centers, and I keep a running file of photo notes on my iPhone and iPad, for future reference. 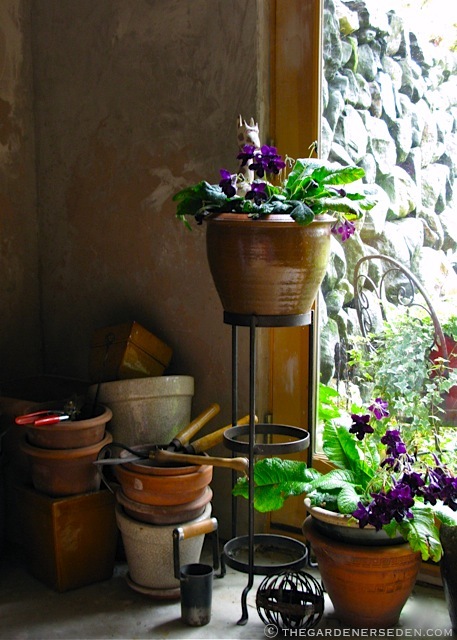 For more inspiration, revisit my previous posts on shade gardening here and posts listed by topic in the lower right sidebar. See more images of the Secret Garden here and browse through more photos of the Secret Garden and other garden rooms at Ferncliff, throughout the seasons, here. 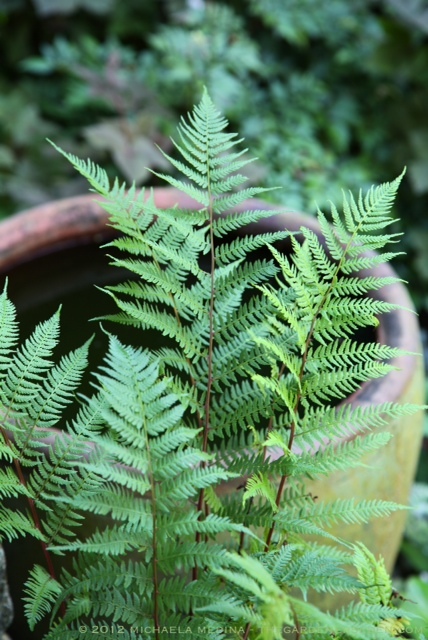 Needless to Say —Given the Name of My Garden— I’m Ridiculously Infatuated with Ferns. Delicate as a Voile Curtain, this Lady in Red (Athyrium filix-femina) Catches Every Breeze at the Secret Garden Door. Notice the Reddish Hue of the Stems, From Which this Cultivar Takes It’s Name. The Effect is More Pronounced in Early Spring, When the Sanguine Fiddle-Heads Unfurl. 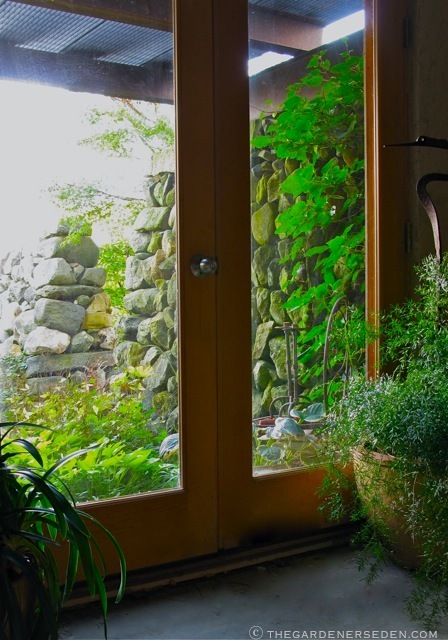 Inside-Out: Now the Asparagus Fern has Become too Large to Move Back & Forth, It Stays within the Secret Garden Room Year-Round; Bringing a Touch of Verdant Beauty to the Plastered Walls Within. 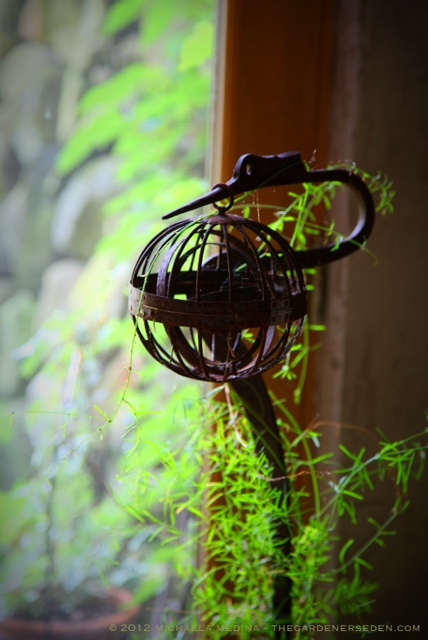 I Love Adding Metal, Stone and Clay Objects to Shade Gardens, Where They Often Rust or Collect Moss; Adding Subtle Color Contrast and Texture to Quiet Vignettes. 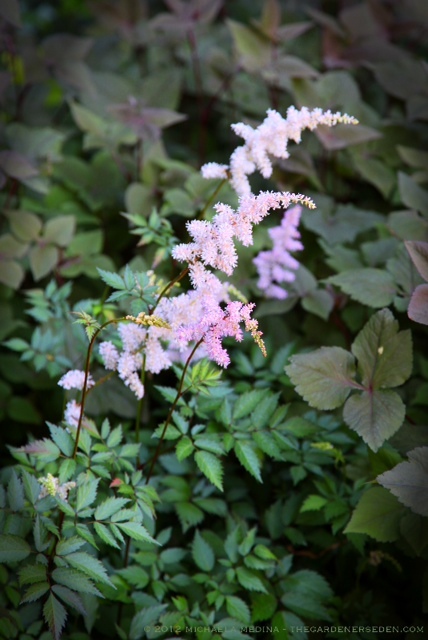 Blossoms of Astilbe x arendesii ‘Europa’ Offer Beautiful Color to Contrast with the Violet Undertones of Japanese Mitsuba Leaves (Cryptotaenia japonica atropurpurea). Herbal Mitsuba is a Lovely Perennial Ground Cover, but Self-Sows with Abandon. I Suggest Clipping the Foliage short and Dead-Heading Before the Insignificant Blossoms Emerge to Prevent Re-Seeding. 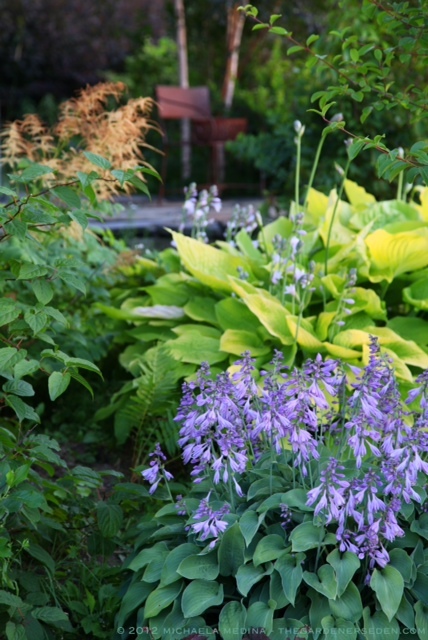 Texture and Foliage Color are the Keys to Creating an Interesting Shade Garden. 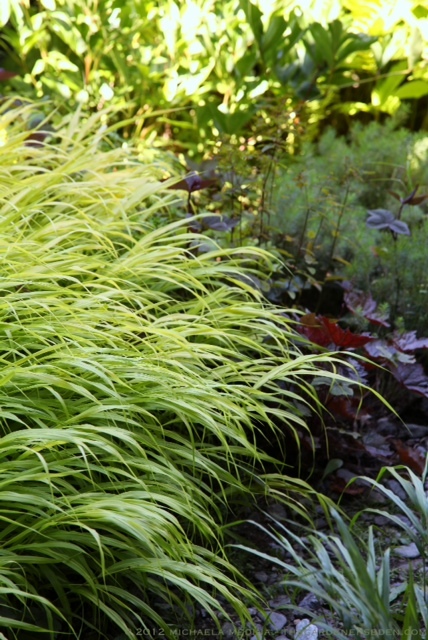 Shade Tolerant Ornamental Grasses are a Soft and Elegant Option. Among the Best? Japanese Forest Grass (Hakonechloa macra). I Love the Many Cultivars and Frequently Use Them in My Designs. My Favorites Include H. macra ‘All Gold’ —Pictured Here in My Secret Garden— and the Subtly Variegated H. macra ‘Aurea’. In Areas with a Bit More Sunlight, I Often Opt for H. macra ‘Beni Kaze’ or H. macra ‘Nicholas’. Both of the Latter Cultivars Have Brilliant Autumn Coloring. 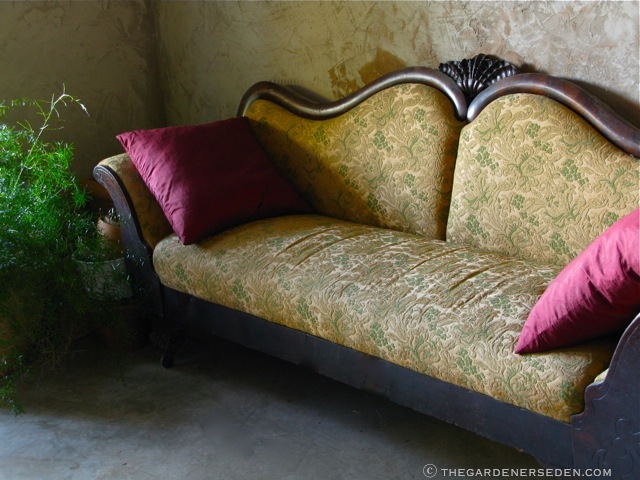 You are currently viewing the archives for Monday, July 16th, 2012 at The Gardener's Eden.